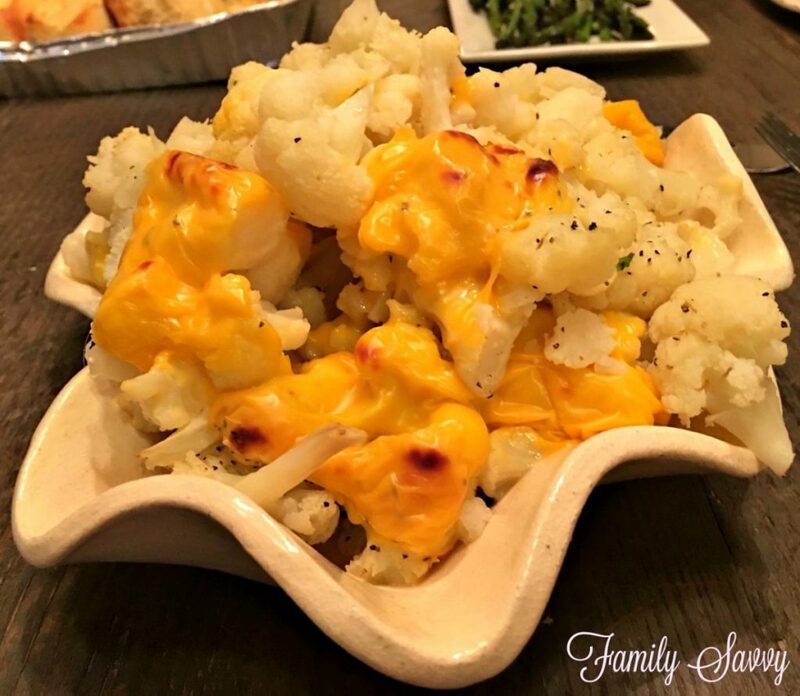 Cheese topped cauliflower is a quick, easy and yummy cruciferous veggie side that goes with most any meat and is a great substitute for potatoes. Cauliflower is commonly substituted for potatoes by those following a Paleo or low-carb diet, so finding great cauliflower recipes is easy. Some of my faves are cheesy twice baked cauliflower, cheesy cauliflower breadsticks, and easy cauliflower crust pizza. This cheese topped cauliflower is super easy. It is steamed, placed in a baking dish, topped with cheese, and baked just until the cheese melts. Add salt & pepper to taste, and you have a fabulous side! I got this recipe from my husband’s business partner Duane, who served this alongside a fabulous dinner of filet mignon, salad, and crab bisque. I couldn’t believe how good it was and later asked Duane how he made it. He shared the simple technique along with the simple secret~use Velveeta cheese slices (sharp when available). Other cheeses won’t melt like Velveeta or yield the same results. 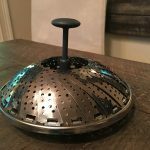 I use this vegetable steamer for all my stovetop steaming~mainly cauliflower, broccoli, carrots and summer squash. My steamer is one of the less expensive ones on amazon (currently $6.99). 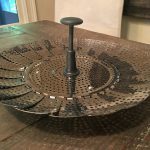 The Cook’s Illustrated equipment reviews recommendations were this Oxo Good Grips Steamer Basket which costs a bit more than mine and this Joyce Chen Bamboo steamer which I had once but which was too much trouble to use and took up too much space. My little expandable steamer does the trick and takes up hardly any space. How to use a steamer basket: Place steamer filled with veggies in stovetop pan that has just enough water to come below (but not through) steamer holes. Cover pan; bring water to a boil. Cook until veggies are just tender but not too soft. For cauliflower, it takes 6-8 minutes. When food is steamed, immediately remove from the heat so cooking will not continue. If you need a quick side and have cauliflower and cheese slices on hand, give this a try. I’d love to hear how it turns out! As always, thanks so much for stopping by. Be blessed, and stay savvy!! !